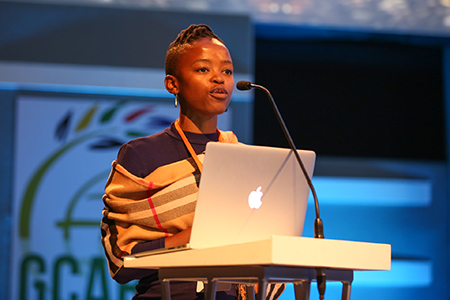 Farming needs a change of image if it is to attract more young people as a career, according to young agricultural leaders addressing an international meeting on global agricultural research for development held in Johannesburg this week. Representatives from farming, science, research, academia, the private sector, civil society, government, and non-government organisations came together for the Global Event of the Third Global Conference on Agricultural Research and Development (GCARD3). The meeting was hosted by the South Africa Agricultural Research Council and organised by the Global Forum on Agricultural Research and CGIAR and was part of an ongoing worldwide conversation about how to meet the needs of resource-poor farmers and their communities. A strong theme emerging from the meeting was the need for young people to be involved in agriculture. Farming is an aging profession. The average age of farmers around the world is between 50 to 60 years old. Dimakatso Sekhoto, a director at Makolobane Farmers Enterprises, shared her experience as a young black farmer in South Africa. She said agriculture offers many exciting opportunities for young people. “The young people are the future of (this) country and the world. My experience as an emerging young black commercial farmer has taught me that you have to embrace agriculture and change how it is viewed in order for the younger generation to participate. “I started in the financial services sector and what inspired me to go into agriculture was that I wanted to be the change that I wanted to see in my country,” she said. “So how do we get youth into agriculture? We need to find ways to ensure that those who have chosen agriculture (as a career) are seen as successful,” she says. Ms Sekhoto also believes there needs to be alternative pathways for financing agriculture. She has established a new company called GrowthShoot to match young farmers with new investors through crowd funding, angel investors and venture capitalists. Jim Leandro Cano, from the Young Professionals for Agricultural Development (YPARD) based in the Philippines, believes that a major problem is that young people do not see agriculture as profitable. “There needs to be a grassroots campaign to ensure that young people in the rural and urban areas understand the value of agriculture, and that with the advancement of technology and research, they can farm smarter and earn better,” Mr Cano said.